Lifestyle style drugs are defined as medicines which are used to treat diseases arise due to lifestyle illnesses or habits such as smoking, alcoholism or unhealthy diet habits. Lifestyle medicines are aimed at improving person’s quality of life by treating conditions that are not lethal or non-painful which include baldness, wrinkles, impotence, acne, weight loss, insomnia, and others. Over the past few years, lifestyle drugs have become commercially attractive and one of the most dynamic industries across the globe. Growing popularity of lifestyle drugs is primarily driven by attributors such as increase in stamina, memory, concentration and energy level which are of prime need among youth and middle aged population owing to stressful and unhealthy lifestyle. Geographically North America dominated global lifestyle drugs market, due to higher awareness about lifestyle related disease, better healthcare infrastructure and better spending power of its citizens. North America was followed by Europe and Asia-Pacific as second and third largest market of lifestyle drugs. Asia Pacific is projected to have fastest growth, owing to rapidly changing lifestyle of the people in the region due to industrialization and developing health care coupled with increasing awareness in developing nations such as China, and India in this region. Among all the drug class weight loss related drugs is expected to have fastest growth during the period of study. This report identifies the global lifestyle drugs market size in for the year 2014-2016, and forecast of the same for year 2021. 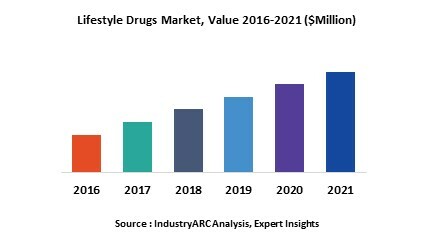 It also highlights the market drivers, restraints, growth indicators, challenges, and other key aspects with respect to global lifestyle drugs market. 9.9. Merck & Co. Inc.